It's with great fondness that Stephanie and I welcome Rob & Beth Lott to our budding staff family! We've known Rob since he was in junior high and we're still amazed at his ability win our hearts on and off the stage. Somehow, he won Beth's heart as well, (a great mystery to be further explored) and the two of them have been married for four years, now. 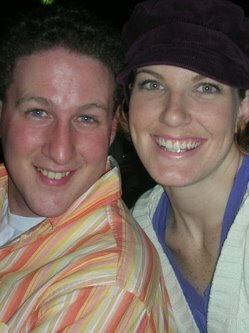 Rob & Beth have been in Orlando and Tokyo for the last five years in various entertainment roles with Walt Disney, and Sea World. Rob's role in the church will be to make our environments irresistible, particularly Sunday mornings. While Rob will not be directly leading worship from the stage, he will be indirectly leading us in worship as he plans and executes the myriad details of creating foyer environments with excellence. Rob & Beth are looking forward to joining us in Alpharetta for the next few weeks and then on to Jacksonville. (Right, guys?) Expect to see them active not only in the church, but in local community theatre as well. Get ready, Jacksonville! That is just a great picture of my wife. She is so good lookin'. Hey everybody! I have officially started my internship at NorthPoint and I am SO very excited to finally be here and to be getting started. I don't have a cubicle just yet...but I am not discouraged. Beth and I are looking forward to meeting everyone there in Jacksonville. We will appreciate all the help we can get learning our way around town, as well as navigating this new chapter in our lives. We'll see you all in a few weeks.